"Memorial de algunas cartas que se habian de escribir a differentes personas sobre el matrimonio de la reyna de Inglaterra." The points (apuntamientos) to be written to Micer Mai are as follows: 1. That in the original agreement of the king of England (Henry VII.) with the King Catholic about the marriage of Henry with Katharine, are two or three passages declaring that the marriage with Arthur was consummated, although this is not affirmed in the dispensation. Sends by the first courier a copy of the brief of pope Julius to the king of England upon the dispensation for the second marriage. The documents which it is now important to produce in the Queen's behalf, and send to Rome, are as follows: 1. The agreement for the second marriage, confirmed by the Kings Catholic, 24 Sept. 1503, ("paso ante Almazan,") at Saragossa. 2. A treaty of the Kings Catholic for peace, and the first marriage, anno '99, with an instruction apart (secretaries Hernan d'Alvarez and Colonna)—at Valencia. The documents to be presented by virtue of the compulsoriales are the following: 1. The second capitulation between the Kings Catholic and Henry VII. upon the marriage of Henry. 2. 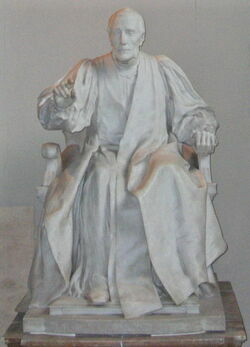 The power given by the Kings Catholic to Hernan Duque to demand the 100,000 cr. from the king of England, and to let him (her ?) come to Spain to the Queen con su familia. To search for letters of the ambassador in which he wrote that [the King] does not wish to let her [return], nor to restore her property; and letters of the King himself upon the same subject. A letter signed by Henry VIII. acknowledging the receipt of 500,000 cr. for the dower of the second marriage, sealed. A bond given by certain Genoese to pay Henry VIII. 45,000 cr. of the same dower. A copy of another letter, signed by a notary, of the payment of 100,000 cr. of the first marriage. An account of the expenditure of 200,000 cr. of the first marriage. This Doctor Beltran took to get authenticated by the notaries. A letter of the King Catholic to the said Doctor ought to be presented, because he says in it that he will have a greater war than against the Turk. The letter of Henry VIII. after his marriage, stating that he was well satisfied, and of his coronation anno 1509. Two letters from Henry VII. respiting payment of the dowry, in which he says that he has forborne to accept some other proposal of marriage, with more money. Also the letter written by the king of England to pope Alexander upon the dispensation for the second marriage, dated 28 Nov. 1504. There ought also to be presented the letter which Dr. Beltran has, signed by the King Catholic, which he delivered to the archbishop of Toledo. It seemed from the prorogation of the interview which the French demanded, that there was some suspicion of a rupture, especially as Brian, who was to set out immediately after Langey, had not left; so that Norfolk, who came the day before yesterday to buy silk, and other great men, were not making any preparations. Now everything is settled again, and the Grand Esquire (fn. 1) will go tomorrow, instead of Brian, to wake up the French, and tell them that the King has started; which he will do on Friday next, St. Francis's Day. In order to avoid Rochester and other places where they are dying, the King will go from Greenwich to Gravesend in his barge, and stay there for a day at the house du gentilhomme. There he will embark in the Minion, of 150 tons, and sail to an isle in the Thames, and feast for three days at the house of a gentleman named Chennet (Cheney). Thence he will travel by land to Canterbury and Dover, and cross the sea in the Minion. He expects to be at Calais by the 15th. However cold other people have been, the Lady has been busy in buying costly dresses; and the King, not contented with having given her his jewels, sent the duke of Norfolk to obtain the Queen's as well. She replied that she could not send jewels or anything else to the King, as he had long ago forbidden her to do so; and, besides, it was against her conscience to give her jewels to adorn a person who is the scandal of Christendom, and a disgrace to the King, who takes her to such an assembly; however, if the King sent expressly to ask for them, she would obey him in this as in other things. Though he was vexed at what she said, he did not fail to send for them by one of his chamber, who had letters to the Queen's chancellor and chamberlain as well as to herself. The man told her the King was surprised that she had not sent her jewels, as the queen of France and many others had done. She excused herself, and sent all she had;—with which the King was much pleased. A week ago the French ambassador, on his way to a feast given by the Lady at a house presented to her by the King, called at Chapuys' house. Showed him a summary of news of the Turkish camp obtained from prisoners. He was not pleased at it, and would gladly have evaded a promise, made before seeing it, to show it to the duke of Norfolk. He revenged himself by discrediting the news, and adding that Neustat was taken, and that 10,000 lansquenetz had been overthrown by the Turks. Heard this afterwards from the Duke while telling him of the raising of the siege of the castle and village of Guns. He was pleased at this, as an opportunity of confounding the Ambassador, who, he says, often tells them fictitious news. He has lately spread a report that the dukes of Bavaria were ill disposed towards the Emperor on account of the bad conduct of certain Spaniards, and threats used by a Spaniard who was sent by the Emperor to ask them for artillery. This is the kind of reports he spreads, either because he wishes them to be true, or to strengthen the pretext for the interview. Norfolk told Chapuys that he had always been of opinion that the King ought to tell the ambassadors, especially the Emperor's, about this interview, so as to remove suspicion of an intention to attack Flanders while the Emperor was engaged elsewhere. Said this was not likely, as neither King pretended any claim to it. To which the Duke replied that Chapuys' opinion was not very certain, and if they played at "laisser fere François," the contrary would soon be seen; and as to the English, it was not in the King's power to move them against the Flemings, nor the Flemings against them. His conversation showed him to be unfavorable to the French, but he tried to hide it by extolling the friendship of the two Kings. Said that the Emperor was equally rejoiced at their friendship, as he desired nothing so much as the union of Christendom; but as this friendship was excessive, it was dangerous;—supporting the statement by various reasons, which the Duke said he should repeat to the French ambassador. Met the latter today, and he seemed more modest than before, praising the Emperor, and expressing a hope that there would soon be greater friendship between him and his master. Eight days ago the King met the Princess in the fields, but did not say much to her, except to ask how she was, and assure her that in future he would see her more often. It is certain that the King dares [not] bring her where the Lady is, for she does not wish to see her or hear of her. Thinks he would have talked with the Princess longer and more familiarly, if the Lady had not sent two of her people to listen. There is no likelihood of a treaty of marriage between the duke of Orleans and the Princess, as the King did not speak of it to her. The Princess will be at Windsor during the King's absence. The arrangements for the Queen are not known. 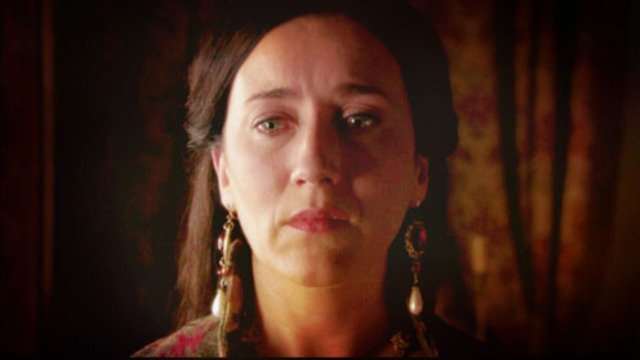 The Queen was very much afraid that the King would marry the Lady at this meeting; but the Lady has assured some person in whom she trusts, that, even if the King wished, she would not consent, for she wishes it to be done here in the place where queens are wont to be married and crowned. Three weeks ago the Scotch king ordered all men between 20 and 60 to put themselves under arms. This is reported by two servants of the Nuncio whom he sent back from Scotland because they were English. 20,000 men have taken the field, and a number of Irish. In England men and horses are continually moving to the defence of the Borders. Some raids have been made, and small villages burned. Many would not think much of invading France, which could repel them much more easily than before; but it seems to many others that the Scotch would have an advantage now from the King's misgovernment, which has alienated all the nobility and people. The Scotch continue in their enterprise, and the French will not stick to the English, and declare the Scotch enemies. The English already begin to murmur that the French are cheating them, and will not continue their cordiality (les Francois les pipent, et ne demeureront cousins). A man whom Chapuys sent to the Grand Esquire has just returned with a message from him that he is going against his will to France to hasten the interview, and would rather break it off if he could; and that the King is rather vexed that Madame d'Alençon will not come, but instead of her Madame de Vendosme, who will probably bring with her companions of bad reputation, which would be a disgrace and an insult to the English ladies. These people cannot see the mountain in their own eyes, and wish to take the straw from the eyes of others. The King has ordered general processions to be held three days in the week, beginning at last Ember days. The people came with devout intentions of praying for the Emperor's victory, though the cause was not stated. Thinks it was done from shame, as the French had behaved so well. As to the indulgences, there is no question that the King would have wished to allow them to be published so as to continue his threats against the Pope (pour, comme je croys, continuer a ses braveries contre le Pape). The duke of Norfolk says that the King has recalled his Ambassador with the Emperor (Cranmer), and sent in his place the archdeacon of Ely (Hawkins), who did him good service when he declared himself Head of the Church, and in everything that has been done and written against the Pope. He was for a long time in prison for Lutheranism, and was condemned to carry a fagot by his uncle, the bishop of Ely. Is sure that he will have instructions and money to procure opinions about the divorce. It has been determined by the King and his Council that all the ambassadors, except the French, shall remain here, the pretext being want of room at Boulogne and Calais. Is sorry not to be able to go to serve the Emperor there, and fears they will not allow him to send a man, on pretence of his waiting for the packets there, and giving the King anything addressed to him immediately. London, 1 Oct. 1532. 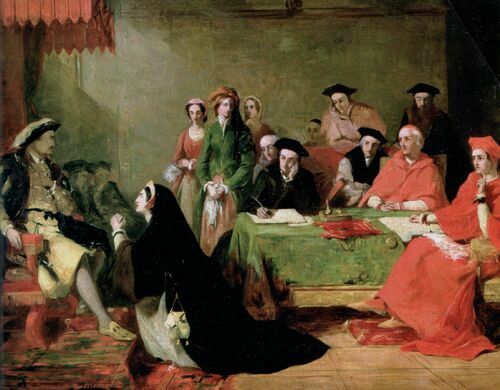 "The record of the proceedings at twelve sessions of the Papal Commissioners in the matter of the divorce of Catherine of Arragon from Henry VIII. Begins : In Dei nomine Amen. Per præsens publicum instrumentum cunctis appareat evidenter quod ultimo die mensis Maii, A.D. secundum cursum et computationem ecclesiæ Anglicanæ 1529, Indictione II. Pont. Sanctissimi. At the end are the separate certificates of the notaries William Claiburgh and Richard Watkyns. Fastened to the latter is a letter testimonial respecting these two notaries, by Nicholas Wootton, dated London, 1 Oct. A.D. secundum cursum et computationem ecclesiæ Anglicanæ 1533. Mention is also made of a seal which has been torn off. Every leaf of the record is signed, R. Watkyns." -The Princess Mary to Henry VIII. This morning my chamberlain came and informed me that he had received a letier from Sir Will. Paulet, controller of your House, to the effect that I should remove at once to Hertford castle. 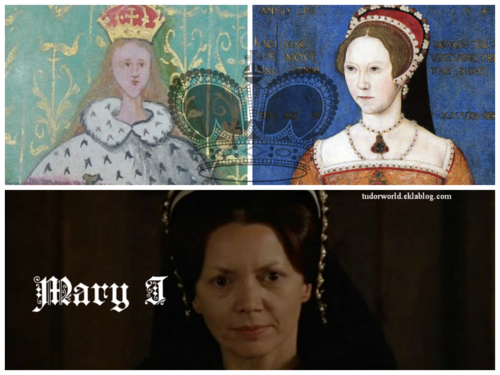 I desired to see the letter ; in which was written "the lady Mary, the King's daughter," leaving out the name of Princess. Marvelled at this, thinking your Grace was not privy to it, not doubting but you take me for your lawful daughter, barn in true matrimony. If I agreed to the contrary I should offend God ; in all other things you shall find me an obedient daughter. From your manor of Beaulieu. 1569 -Thomas Howard, 4th Duke of Norfolk arrested.He was the son of the poet Henry Howard, Earl of Surrey. He was taught as a child by John Foxe, the Protestant martyrologist, who remained a lifelong recipient of Norfolk's patronage. 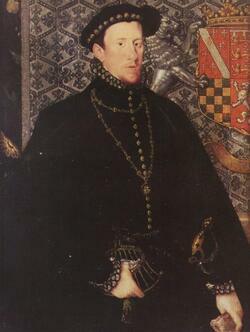 His father predeceased his grandfather, so Norfolk inherited the Dukedom of Norfolk upon the death of his grandfather, Thomas Howard, 3rd Duke of Norfolk in 1554.Norfolk was the second cousin of Queen Elizabeth I through her maternal grandmother, Lady Elizabeth Howard, and he was trusted with public office despite his family's history and leanings towards Catholicism (although he was brought up a Protestant). It was the 4th Duke of Norfolk who commissioned Thomas Tallis, probably in 1567, to compose his renowned motet in forty voice-parts, Spem in alium.Queen Elizabeth imprisoned Norfolk in 1569 for scheming to marry Mary, Queen of Scots.